Under this title you expected me to say something philosophical, right? No, today’s story is more prosaic. My father was a coal mining engineer. He worked in the underground coal mines in Turkey for 25 years. When I was in high school he took me to the working areas 300 meters underground few times. I remember the cage elevator that takes people down. It was a scary experience. In those days I could never imagine that I was going to be a physicist someday let alone imagine physicists doing experiments in the underground caverns of gold mines. I was reading about the construction of the LUX-ZEPLIN experiment (a next-generation dark matter detector that will be at least 50 times more sensitive than its predecessor). LUX-ZEPLIN is located 1 mile below the surface in a cavern within the former Homestake gold mine in South Dakota. Physicists started using the Homestake gold mine in the mid-1960’s. Raymond Davis Jr. and John N. Bahcall set up the Homestake Experiment and observed the solar neutrinos for the first time. So, I was looking at this diagram showing that the LUX-ZEPLIN cavern is 1 mile below the surface, remembering my scary experience in a “cage” coal mine elevator in Turkey, and thinking how long would it take to reach the bottom. 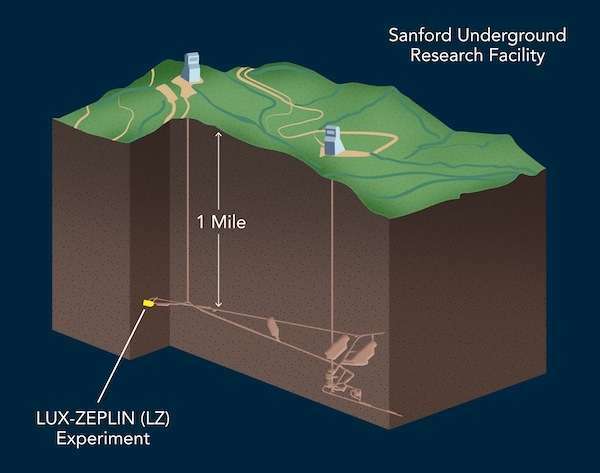 I have never visited the Sanford Underground Research Facility (Homestake Mine in South Dakota) so I don’t know the exact answer but I learned here that the deepest mine in the world – a gold mine located in South Africa – has a similar shaft (deeper actually, 1.6 miles deep) and it takes only 6 minutest to reach the bottom. This entry was posted in physics and tagged dark matter, Homestake Mine, LUX-ZEPLIN, South Dakota. Bookmark the permalink.